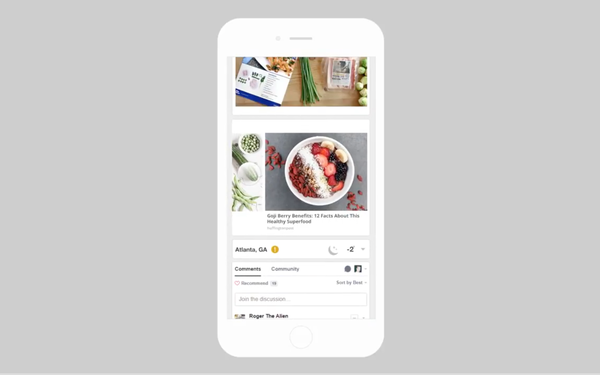 Taking a page from the social media giants, Taboola on Wednesday launched a feed that it said represents a new content-discovery experience for advertisers and publishers. The content discovery firm said Taboola Feed represents the future for the 10-year-old company, since all content has moved to mobile. The move to a feed-based environment shifts Taboola away from widgets. The feed is also a way of helping publishers. “People spend a lot of time daily scrolling. People barely read one article, and then they interact with their social feeds but this prevents publishers from growing. The future is that people read articles and then interact with publishers’ feeds versus going back to their social feed,” said Adam Singolda, CEO, Taboola. Taboola will expand its use of “cards”-- which can be anything that a company thinks users might like to interact with on a publisher’s site -- and launch a card marketplace similar to the App Store for weather, news, and other types of content. The marketplace will enable startups and other companies to create custom card experiences that publishers can integrate into the feed. The goal is to encourage consumers to linger on publishers' pages. Singolda envisions a marketplace where publishers log into Taboola and say, "I should have a weather card in my feed," and third-party developers will build cards for publishers to put in their own feeds. Any developer can create cards, and publishers would decide who makes it into their feeds. Taboola already offers content recommendation, video, and recirculation cards. Taboola said it developed and tested the feed with the New York Daily News over the course of several months; the feed is now being deployed with other publishers. The idea is to encourage more engagement with publishers’ owned content and within publishers’ sites. Since employing the Taboola Feed on its pages last month, the New York Daily News reported seeing a revenue increase of 26% and engagement of 40% on mobile.